Drainage excavation or relining - what are the pros and cons? In the past the only way to fix blocked drainage was to dig and replace. Now there’s another method in the market that can rehabilitate drainage without excavating. This is called pipe relining. In this article we discuss the pros and cons of drainage excavation versus pipe relining. Drainage excavation can be a cost effective option if the drain is located close to ground surface and located under grass. As there is little to no excavation required which means that little to no reinstatement of paving, garden, retaining walls, bathrooms, tiling, road, driveways, paths, etc. is required. Relining usually takes only 1 day which means limited inconvenience. As soon as the resin cures the pipe work is ready for use. Relined pipe work generally comes with a guarantee. Because it’s “no dig”, you save on the cost, time and hassle of restoring your property and landscaping. You can preserve heritage buildings and trees. Quick installation – most relining jobs can be completed in one day – without the mess and noise of excavation. Relined pipes have improved flow, more effective protection from root penetration than newly installed pipes, and a 50-year life expectancy. We can only offer a 1 year guarantee on new PVC pipes but up to 20 years on relined pipes. Expensive due to the cost of materials and equipment required. Roots can grow back on the un-relined sections. If not installed correctly or with the correct materials roots can grow back between the host pipe and the reline. Relining may not be possible. 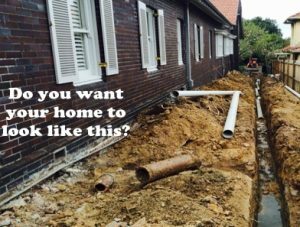 If you would like to find our more about our pipe relining or blocked drain cleaning services, you can call us on 1300 358 434 or contact us here.